John Brown was one of the most famous abolitionists, or opponents of slavery, in history. He traveled widely to gather support and money for his cause. Many people who helped him were either unaware or did not care that he often used violence to achieve his goals. His attack on Harpers Ferry, Virginia, in 1859, freed no slaves and resulted in his own trial and death. Declares "eternal war with slavery"
John Brown was born at Torrington, Connecticut, on May 4, 1800, to Owen Brown and Ruth Mills Brown. His father worked as a tanner, changing animal skins into leather. A religious youth, Brown studied briefly for the ministry but quit to learn the tanner's trade. He married Dianthe Lusk in 1820, and the couple had seven children before her death in 1832. In 1833 he married Mary Ann Day, with whom he had thirteen children in the next twenty-one years. Of Brown's twenty children, twelve survived. When Brown was twelve years old, he saw an African American boy mistreated; this incident, he said, led him to declare "eternal war with slavery." He felt that slavery could be destroyed only with bloodshed, deciding in 1839 that the South should be invaded and the slaves freed at gunpoint. For the next decade, he attempted a number of business ventures, none successfully. He moved his family ten times, until settling in 1849 on a farm at North Elba, New York. After the Kansas-Nebraska Act of 1854, the territory hung in the balance while supporters and opponents of slavery tried to gain control. According to the Kansas-Nebraska Act, the people living in the territory would decide whether or not slavery would be allowed in Kansas and Nebraska. Brown traveled through the East, urging an end to slavery in Kansas and gathering money for weapons to help achieve that end. "Without the shedding of blood," he said, there could be "no remission of sin." In other words, he believed that the people who supported slavery and the slave system would not be freed from the guilt of what he saw as a sin until slavery was ended. He thought that the only way to end slavery was through fighting, even if it would result in the death of some people. In September he settled near Osawatomie, Kansas. "I am here," he said, "to promote the killing of slavery." In 1856 he led a raid on a proslavery settlement at Pottawatomie, Kansas, killing five men before escaping. This incident made him nationally known, and while some people criticized him, to others he was a hero. Brown spent the summer of 1856 in New England collecting money for his fight against slavery. Important public figures, some unaware of the details of his activities, were impressed by his dedication and helped him gather recruits, guns, and money. In August he and his supporters fought with settlers at Osawatomie, and his son Frederick was killed. "I will die fighting for this cause," Brown wrote, "There will be no peace in this land until slavery is done for." Brown went east in early 1857 with plans to invade the South; he gathered supporters at Tabor, Iowa, for training. He held meetings with eastern abolitionists, and in early 1858 sent his son John Jr. to survey the country around Harpers Ferry, the site of a Federal arsenal (a place where items used by the military, such as equipment and weapons are made or stored). In April he held a meeting of his men in Chatham, Ontario, Canada. He explained to them that he planned to invade the South, arm the slaves, and set up a free state under a new constitution. He returned to Kansas using a different name and led a raid into Missouri, killing one man and taking some slaves back to Canada. Brown was now considered a criminal in the eyes of the state of Missouri and the U.S. government, and both offered rewards for his capture. However, in parts of the North he was seen as a hero, and donations poured in. In early 1859 he toured the East again to raise money, and in July he rented a farm five miles north of Harpers Ferry, where he recruited twenty-one men for final training. He intended to seize the arsenal, distribute arms to the slaves he thought would support him, and set up a free state for African Americans within the South. However, Harpers Ferry was an isolated mountain town, with few slaves nearby. On the night of October 16, 1859, Brown set out for Harpers Ferry with eighteen men and a wagon full of supplies, leaving three men behind to guard the farm. Brown's party slipped into town and easily captured the armory (a storage place for weapons) watchmen. For some reason, Brown allowed the midnight train to go through; the train's conductor sounded an alarm the next morning. Shooting broke out early on October 17, 1859, between Brown's men and local residents. Soldiers soon arrived from Charles Town, West Virginia. By nightfall Brown's group was trapped in the armory's engine house; all but five were wounded. That night ninety marines arrived from Washington, D.C., to join the fight against Brown and his men. The next morning the marines stormed the engine house, slashing Brown with their swords. Of Brown's original party, ten died and seven were captured; on the other side the victims included a marine and four other men, one of them a free African American killed by mistake. Brown was jailed at Charles Town. His trial took place a week later as he lay wounded on a stretcher. "I believe that to have interfered as I have done," he said, "in behalf of His despised poor, I did no wrong, but right.… I am ready for my fate." He was convicted of treason (a crime against the government) against Virginia, conspiracy (plotting) with African Americans, and first-degree murder. The court sentenced Brown to death on November 2. He was to be executed a month later. News of Brown's deed shocked the nation. Many praised him, including Ralph Waldo Emerson (1803–1882), who called him "that new saint who will make the gallows like a cross." However, many believed that his crime had been terribly evil. Seventeen of Brown's acquaintances sent letters on his behalf to Governor Wise of Virginia, but Wise ignored them. Brown was hanged at Charles Town on December 2, 1859, with four of his men, after handing a note to his jailer on his way to the gallows: "I John Brown am now quite certain that the crimes of this guilty land: will never be purged away; but with Blood." The note predicted what was to come in the near future. In fact, the end to slavery in the United States came with the end of the Civil War (1861–65). The Civil War was fought to decide whether or not slavery would be allowed in new territories and in an effort to prevent the southern states from leaving the Union and forming an independent nation. Many people throughout the North gathered to mourn Brown, and church bells tolled at the hour of his execution. He was buried in North Elba, a hero among abolitionists. By the time a song about him, set to the music of an old hymn and named "John Brown's Body," became popular in 1861, he was already a legend. Cox, Clinton. 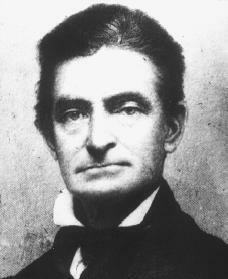 Fiery Vision: The Life and Death of John Brown. New York: Scholastic, 1997. Dubois, W. E. B. John Brown: A Biography. Armonk, NY: M. E. Sharpe, 1997. Oates, Stephen B. To Purge This Land with Blood: A Biography of John Brown. Amherst: University of Massachusetts Press, 1984. Read the novel "Cloudsplitter" by Russel Banks. Remarkable reading! i loved this biography about john brown. man i tell you what this was a good life lesson.